Follow the idyllic mountain paths, stroll through romantic alpine meadows and enjoy the impressive mountains which tower like a stone wall around the 500,000 m² grounds of the PURADIES chalet village and mountain hotel resort, creating a fantastic alpine setting for your holiday. It's not only from the sunny PURADIES plateau that you can enjoy incredible panoramic views of the larger-than-life beauty in the Salzburg Alps. 400 km of mountain hiking trails, Austria's largest bike park and countless sports and recreational activities invite you to discover Leogang's nature right from the hotel. After an exciting day in the Leogang mountains, you will find that the revitalising spring water in the hotel's swimming pond provides the perfect refreshment. Just as wonderful is warming up your spirits in our "INNERE MITTE" sauna paradise - sure to make your holiday in Salzburg unforgettable! Just one look at the happy farm animals at the PURADIES mountain hotel, and you will feel your body starting to relax. One could almost feel jealous of the cows, calves and chickens who enjoy their unrestricted freedom surrounded by the most beautiful alpine scenery. 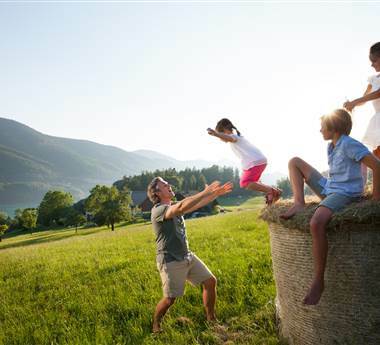 Kids especially love the tame, cuddly farm animals and will certainly make lovely memories that will last them a lifetime. The alpine grasses sway gently in the warm summer breeze and fill the pure Salzburg mountain air with the lovely scent of wild alpine violets and fragrant mountain flowers. With your heavy mountain boots stretched out far in front of you, you lie completely relaxed in the warm grass of the Leogang mountains and squint into the warm sun. Suddenly, the whistle of a chamois breaks the absolute silence and, indeed, high above the majestic peak of the Birnhorn, a proud rock eagle soars in a lonely circle.